From the outset, I would like to welcome you all to the 16th meeting of the International Contact Group in Kabul. Please allow me to first honor the immense sacrifices and invaluable investments you have made for a more just, peaceful and democratic Afghanistan. We are gathering here at a very crucial time when two significant processes, the democratic transition of power and the assumption of full responsibility by our National Defense and Security Forces, have come to a conclusive end. First, Afghanistan is moving forward responsibly to overcome the challenges, and make the best of opportunities to strengthen democratic processes. Second, our friends and partners have a long-term commitment to the success of these processes, and will continue to support our people’s aspirations for realizing self-reliance, peace and stability. Afghanistan has achieved substantial progress over the past decade in many areas ranging from health to education, economy, human rights, women’s empowerment and governance. But certain challenges still remain, particularly in the area of security, which often cast shadows over our achievements in other areas. Safeguarding and consolidating these, hard-earned gains and addressing the challenges we face, will require close collaboration among all of us. 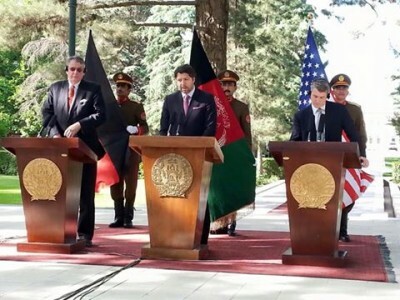 The strong will of the National Unity Government which is reflected well in the leadership of His Excellency President Ghani and His Excellency Chief Executive Dr. Abdullah is making a difference on the ground, improving good governance, accountability, transparency, and preparing the environment for necessary reforms to take place effectively. The long-term commitment of the International Community is of particular significance, providing Afghanistan with the necessary support to implement the much-needed reforms and deliver on our mutual commitments. International Contact Group has been an important forum for consultation and consensus building, and I take this opportunity to profoundly thank all members of the Group for their continued support and efforts for a peaceful and prosperous Afghanistan. I would also like to thank Ambassador Michael Koch, the German Special Representative for Afghanistan and Pakistan for his outstanding leadership, dedication and continued support to this forum. I hope that today’s meeting of the ICG will lead to constructive discussions, and further strengthen our cooperation at all levels, particularly through better regional solutions for a more peaceful Afghanistan. With this conclusion, I would like to invite His Excellency President Mohammad Ashraf Ghani to present his keynote address. Your Excellency, the floor is yours!